B&B: Tell us how and why you started hand-crafting skulls. NM: To be honest I completely fell into this whole skull making thing by accident. 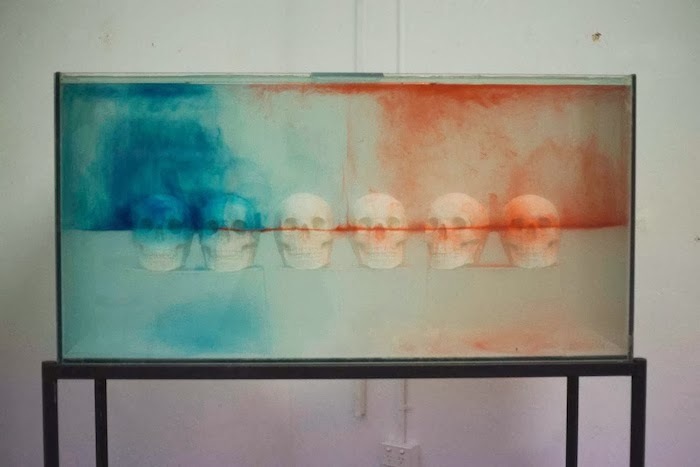 I originally intended to create a single skull to inhabit my bedroom as a fun personal project. I have always been a crafty type of person and this was just another one of those today-I-might-make-this type of mission. I remember, looking back, the first one I made was a complete disaster but everyone thought it was awesome. I have come a long way since then. My friends all wanted one and were throwing different colours at me and I set about making a bunch. Word spread from there and I have been feeding the skull obsessed for just over a year now! B&B: What's the standard process for creating your crafty cranium? NM: The skulls are created with plaster through the technique of casting to form a base shape. Once completely dried out, I give them an undercoat and apply paint, glitter, confetti pieces or patterned fabric strips, all while drinking wine and watching Seinfeld like a multitasking queen. B&B: How do you decide on what fabrics and materials you're going to use? NM: Being in a fabric store is the most overwhelming thing - you’ll never find something if you’re looking for it and when or if you do, you won’t need it anymore. I use whatever jumps out at me amongst the masses and masses of rolls on the day at the time. Thin cotton is the most suitable textile for the decoupage process and prints with a heavily repeated close pattern end up looking the best because join lines in fabric strips are less noticeable. Often I'll buy a bunch of a particular fabric but once that runs out, that’s it, because I know I will never find it again! 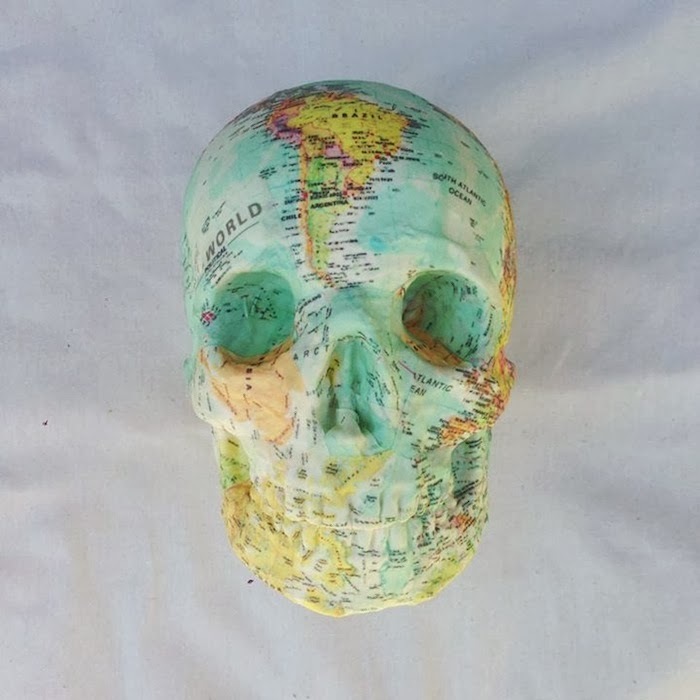 Therefore, all my fabric skulls are limited in quantity which makes them pretty special. B&B: Any material you haven't tried yet that you think would be killer? NM: I have recently been on the lookout for a holographic type of fabric. I found some the other day but it didn’t work upon application because it was too plastic in nature! I am dying to find a way to achieve a holographic or iridescent oil slick coating. It may not be possible with fabric. I have a few other options to investigate. I also want to do some experiments with lace. Recently, I acquired a vintage atlas with some beautiful maps which I will cringe-worthily cut up to use on skulls. 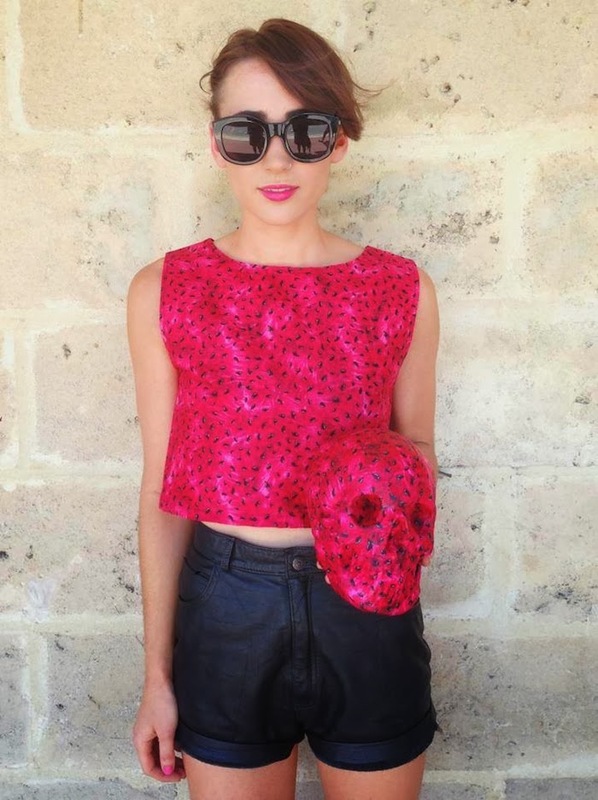 B&B: You recently collaborated with the Kawaii Girls to put out a small range of floral skulls. How did that come about? NM: The Kawaii Girls contacted me with the amazing proposal to create 8 skulls in conjunction with their new clothing range. I was familiar with what they were doing prior so I was very excited to hear from them. We discussed what patterns would work best on the skulls and went from there to create a coordinating collection of handcrafted items. They were incredible to work with and the photoshoots were great fun! B&B: Are there any other collaborations in the works? Who would be your dream collab? NM: I am providing Kelly Flemming, the Perth artist behind Kelly Emma Illustration, with 3 coloured skulls for a collab series. Her work is so incredible and I can’t wait to see her ideas on my skulls. Alex Saba over in Brisbane is busy making me beautiful hand illustrated eye print fabric for use on a limited number of skulls. I am also creating 2 customised skulls to be featured in a photographic tattoo documentation series by Lucy Pallet-Jones. I love that other creatives want to be involved in the process and keep throwing ideas at me. Tim Walker, a London photographer, is my absolute idol. He works with insane set designers and artists to bring imaginary concepts to life. Branching away from my world of skulls I would just die to have the opportunity to be involved in some way with what he does! B&B: What is next for you as an artists? NM: I held my first solo exhibition in October at Common Ground Gallery. The exhibition was a personal milestone, as well as being part of my Interior Architecture thesis. The skulls were involved in mysterious installations that explored bizarre concepts branching from surrealism ideology. Post graduating I hope to combine my knowledge of space with my crafting abilities to work within the realm of set design and styling; creating elaborate shop window displays, extravagant scenes for fashion photography and incredible event environments. I need to get out of Perth! NM: I used to love scary movies so much more when I was younger! But films that have freaked me out in more recent times include Let the Right One In and The Strangers. B&B: You can bring one person back to life. Who would it be? NM: Heath Ledger hands down but Andy Warhol would be a close second! Oh, what a great interview! Those pieces are just breathtaking.